Start planning now for the 2019 Pink Salmon run. Every second (odd) year we get an abundant run of the smallest species of Pacific salmon. 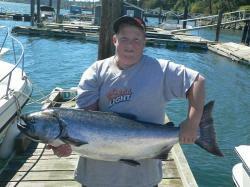 Pinks are the most fun for kids to catch because it's all about quantity. There's not a lot of waiting when the bite for Pinks is on. If you are thinking about introducing your children to the love of fishing then a Pink year is the year to do it! 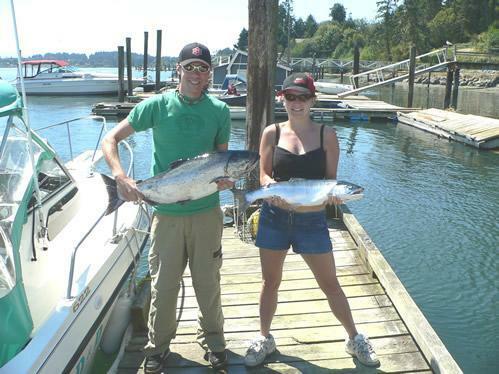 To start your D&D Fishing Charters salmon or halibut fishing adventure, we leave the dock between 0500 hours to 1500 hours to make sure we hit the best fishing times and tides. During your trip, your experienced fishing guide will also act as your knowledgeable tour guide, telling you about the sights along the way. We welcom all your questions and love to talk about fishing. It's your charter and we want you to have the best experience so feel free to get as involved in the fishing experience as you like. Learn about the habits of predatory fish as well as how to prepare and set bait so that you get the perfect roll on your anchovy. Or just sit back, relax, and soak up the beautiful scenery. When your trip is over and we are back at the dock, we clean, cut and bag your fish so that it's ready to take home to the barbeque. Or we can arrange to have your catch smoked, canned and shipped to you. your camera, with either a large memory card or enough film, and fully charged batteries.